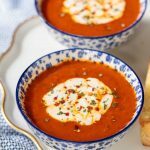 This Roasted Red Pepper Tomato Soup comes together quickly, is bursting with fabulous flavor and is loaded with lots of healthy veggies! Heat the oil over medium heat in a large Dutch oven or soup pot. Add the onion and carrots and cook, stirring occasionally, until onion is translucent, about 8 minutes. Stir in the pesto and cook for another 30 seconds, until fragrant. Add the broth, fire-roasted tomatoes, roasted red peppers, rosemary sprig, smoked paprika, and salt. Bring to a boil over medium-high then cover reduce heat to maintain a slow steady simmer. Simmer for 25 minutes, stirring occasionally. Using an immersion blender or a regular blender, puree the soup, leaving it a bit chunky. If you use a regular blender, allow the soup to cool a bit before blending, then puree in two batches. When blending, remove the cover of the opening at the top of the blender. Insert a small mouth funnel to release the steam while blending or cover the opening with several thicknesses of paper toweling. Return soup to the pot and simmer for another 10 minutes. Taste and add salt and fresh ground pepper, as desired. Serve in bowls and top with fresh mozzarella and chopped fresh basil or rosemary for garnish, if desired. See Café Tips above for additional tips, instructions and ideas for serving.